Custom Marine Products - First Mate Marine Inc. 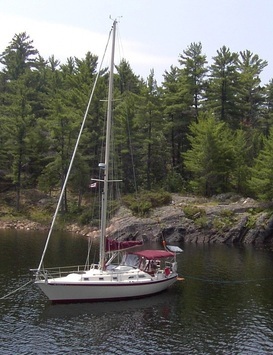 Solar energy is an excellent source of electrical power for the cruising sailboat. We at First Mate Marine have developed numerous approaches for installing a solar system easily and cost effectively. Figuring out the size of solar panel you need and matching it up with the various accessories required for a complete high performance system can be a daunting task. That is why our engineers have developed easy to install complete solar system kits that contain everything you need for your solar system including: solar panels, mounting systems and charge controllers. We offer top-of-pole solar panel mounting systems and an integrated outboard motor lift crane that are cost effective, easy to install and robust enough for challenging weather conditions. Our solar panel mounting systems will accommodate most commercially available solar panels. *** NEW *** Semi-flexible Solar Panels - We have had a number of inquires about flexible solar panels that can be mounted on curved decks or bimini tops. We now offer high efficiency semi-flexible solar panels that can be contoured to curved surfaces with a maximum bending angle of 30 degrees. These panels are available in both 50 and 100 watt sizes.